In this second post on CCNA lab resources We'll be taking a look at Stub Area Networking. A collection of free labs created by Matthew George CCNP. Stub Area Networking offers a welth of free labs on CCNA topics beginning with identifying components (which a lot of other sites don't cover) and continuing through to security, routing protocols and what not. There are over 130 free CCNA labs on this site. The labs are done with GNS3 generally, but can easily be set up with real gear or in a simulator like Cisco's Packet Tracer. The labs contain a good summary of information about the lab goals, real world application, and command usage. Then a topology of the lab is displayed followed by any prerequisites and then the lab walk-through via GNS3. Generally, the labs are wrapped up wtih and example output of what the configuration should look like. All in all a great site for labs. Christmas is upon us and I tend to be the one who is tasked with getting all the gifts for the families. This has led to two things. 1., minimal studying on the SY0-201. 2., Lots of research (going down rabbit holes as it were). 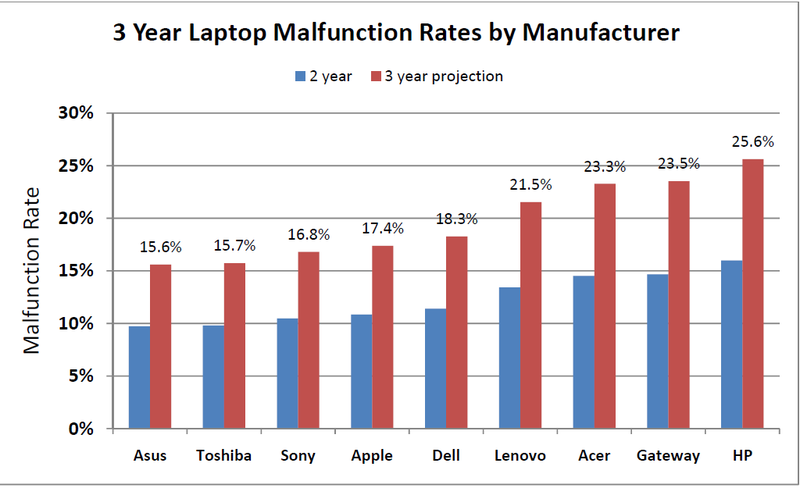 This in turn led me to an interesting find on laptop reliability and manufactures. A few years back Engadget put out an interesting article by Vlad Savov entitiled, "Laptop reliability survey: ASUS and Toshiba win, HP fails." It was a summary of an article put out by eletronista sighting a study done by Square Trade. Square Trade is an after market warranty provider. Here's a link to a PDF of the original study. It essentially puts Apple in 4th place as far as troubles go with their equipment, Asus as the leader, and expectedly, HP as the worst. No one brand stood out as the most reliable among laptop brands. That's what we found out when we asked more than 43,000 readers who bought a laptop between 2006 and 2010 about their experiences. 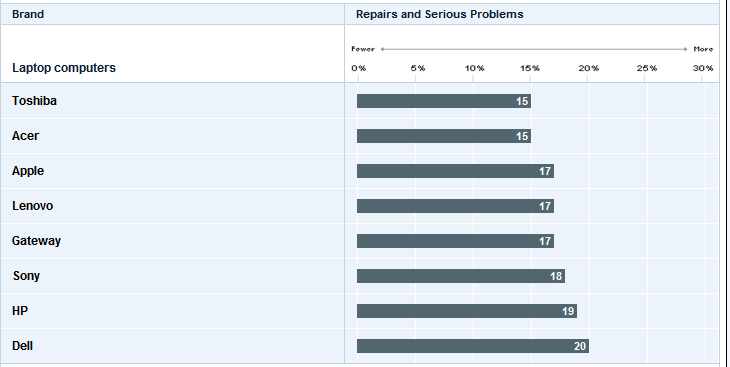 This graph shows the percentage of brands that have ever been repaired or had a serious problem. We've adjusted the data to eliminate differences due to age or whether the computer was covered by an extended warranty. Differences of less than 3 points aren't meaningful. Models within a brand might vary, and changes in design or manufacture might affect reliability. Still, choosing a brand with a good repair history can improve your odds of getting a reliable model. Point being Toshiba (a well known old timer in the PC world) seems to have a handle on QC and decent reliability. I only with their features and design could match up with some of the other big manufactures. I am curious about how volume sold effects these statistics though. Still, I hope this adds some food for thought when looking for your next laptop.